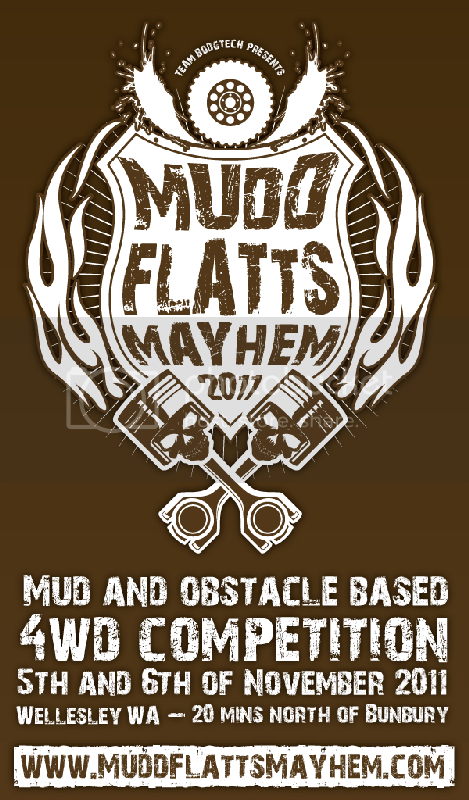 WA: Perth 4x4 presents: Mudd Flatts Mayhem '11! - 4WD Comp! Last edited by n1c on July 15th, 2011, 9:13 pm, edited 2 times in total. Re: WA: Mud Flatts Mayhem 2011! - 4WD Competition! Woohoo, we'll definatley will be there. hell yer im there! bring it on! I would sooooooo be there. Just got some strange looks in the office from the "Nooooo!" cry and desk banging cos I'll be working and won't be able to get it off as 2 of the other guys are already off!!!!!! There are a series of words that come to mind now, none of which can be printed here. Hopefully make it down to the other one to watch though when that gets going. yahoo ill be entering! go the patrol! Currently, we have 35 entries left. Just a reminder that entries close on the 31st of August 2011. Last edited by n1c on July 22nd, 2011, 10:22 am, edited 1 time in total. Wish we could make it Nic. It's a long drive from Apollo Bay, VIC however. Is Team Bodgtech competing at all? Wish you guys could make it! We'll definitely bring over the footage when we trek over there to show you guys! Unfortunately, nope none of us are competing (that wouldn't really be fair would it? :P )...we'll all be too busy..but I'm sure we're gonna enjoy ourselves regardless! Entries close on Wednesday the 31st of August. Was this event held this year. I didn't hear anything about it. It was good last year.